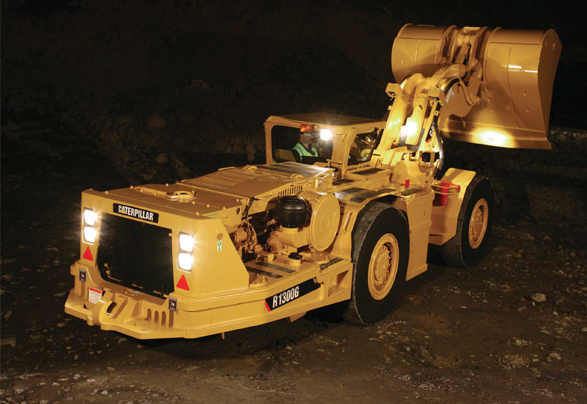 Caterpillar R1300G underground mining scoop/underground loader - LHD | Amalgamated Mining & Tunnelling Inc. The R1300G underground loader is designed for high production, low cost-per-ton loading and tramming in underground mining applications. Compact design with agile performance, rugged construction and simplified maintenance ensures excellent productivity, long life and low operating costs. Engineered for performance, designed for comfort, this LHD is built to last. The Cat® 3306B engine offers the perfect balance between power, robust design and economy. Reliable and rugged design to deliver power and effi ciency for peak power train performance. Perfect balance between low effort controls and powerful forces for smooth and fast cycle time. The heavy duty frame is designed and built to absorb twisting, impact and high loading forces for maximum durability and reliability.